When Kent Townsend set out to do the first training of the year with his daughter’s high school mountain bike team, he knew he would come home tired, but never did he expect that he might not come home at all. “We were riding the Monarch Crest Trail which goes about 12,000 feet across the continental divide,” said Kent. 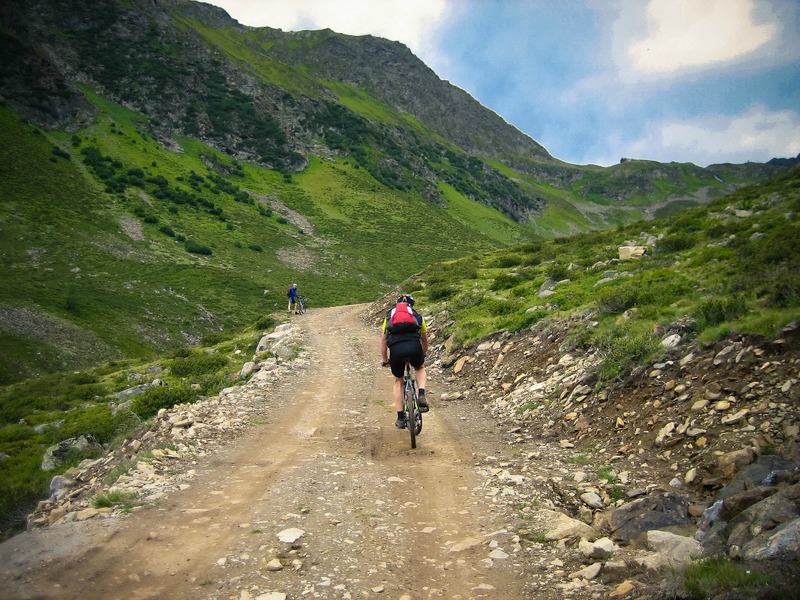 This Colorado mountain biking trail is known for its challenging terrain. It is a single-track trail and riders go one behind another through forested areas and open meadows. The ride was going well and the students and chaperones seemed to be enjoying the challenge of the trail. However, as the group began a particularly steep descent, the rider in front of Kent swerved slightly, clipping a log, sending a large limb right in his path. With no time to slow down, and nowhere to go, Kent slammed into the limb which pierced his groin. He was thrown over the handlebars, and went crashing down an embankment and into a nearby creek. The force from the fall had fractured his pelvis and his sacrum. Shocked by the turn of events, Kent lay in the water as members of his group came down the embankment to help. 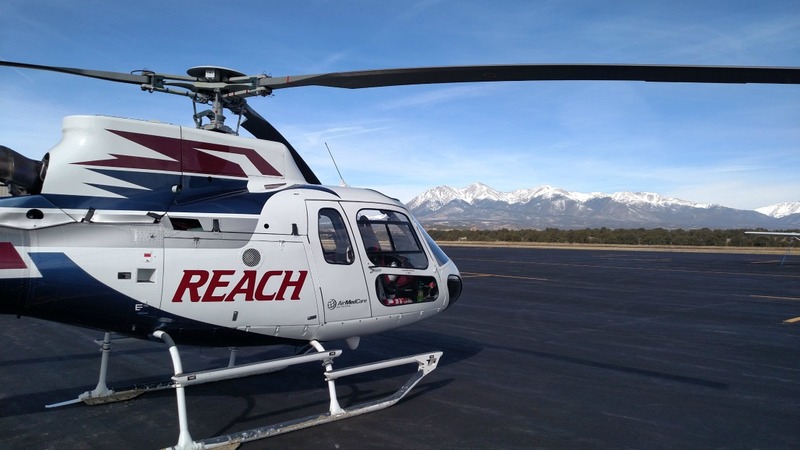 REACH 29 in Buena Vista provides life-saving air medical transport services to several rural Colorado communities. After sending one rider to call for help, the others took to caring for Kent. They carefully removed the limb and applied pressure to help slow the bleeding. Once he was stabilized, the group began formulating a plan to get Kent off the mountain to the care he needed. It was decided that they would try to carry him down the trail where they would hopefully be met by a search and rescue team. Using a makeshift stretcher that one of the chaperons had constructed from a hammock, the group started the seven-mile trek out. Moving in some instances just inches at a time, they were making slow but steady progress. 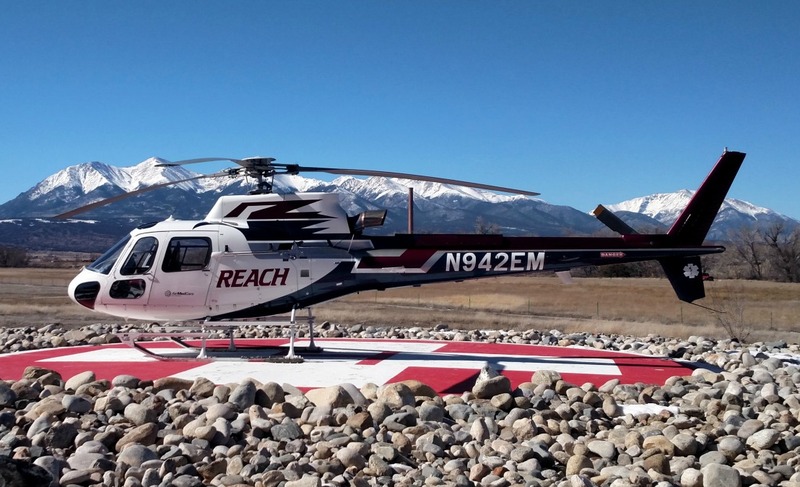 As the group struggled their way down the trail, a call for help was going out to the Saguache search and rescue teams and to the REACH air ambulance base in Buena Vista. As the search parties were making contact with Kent, the REACH crew was in the helicopter above the scene trying to locate the group. In the aircraft that day was Pilot Travis Durbin, Flight Nurse Thomas Salazar, and Flight Paramedic Travis Koppenhafer. With so many trees obstructing their view, the crew decided to land nearby and attempt to reach search and rescue by radio. Shortly after touching down, the crew spotted a motorcyclist coming down the trail. Kent is excited to hit the trails once more. Faced with a four-mile hike to reach their patient, Travis and Thomas made sure to do a full safety assessment before departing the aircraft. Travis and Thomas gathered the medical bag and a stretcher and started on their way. Communication was important for everyone’s safety, so the two kept in touch with their pilot by radio as they made their way up the trail. When Travis and Thomas finally made contact with the group, everyone was nearing exhaustion. Because they were not able to carry all their equipment with them, the two had to rely solely on their clinical skills to assess whether or not Kent was bleeding internally. The REACH 29 aircraft on the tarmac. After administering some much-needed pain medicine to Kent, the crew moved him from the hammock to the stretcher they had brought up the trail with them. Ready to face the daunting four miles back out to the aircraft, the group began taking turns wheeling the stretcher down the trail. As the group neared the end of the trail, Travis decided to run ahead to get the aircraft prepped for transport. Waiting for him at the trailhead was Kent’s wife, Jodie. Being a nurse and the director of a local hospital emergency room, Jodie expected a full report from Travis on Kent’s condition as soon as she saw him. Once the group arrived with Kent in-hand, Travis and Thomas loaded him into the aircraft and lifted off for Memorial Hospital North in Colorado Springs. It was shortly after lift-off that Kent was finally able to take a sigh of relief. While deep and susceptible to infection, Kent’s wound didn’t require surgery; instead, he was given a heavy dose of antibiotics and after three days in the hospital, he was cleared to go home. Kent’s good fortune continued when he learned his air ambulance costs were covered through his family’s AirMedCare Network membership. Finally, despite the traumatic events of their ride that day, the training paid off for Kent’s daughter Madelyn. In her first race of the season, she took first place by 6 minutes in a statewide competition.